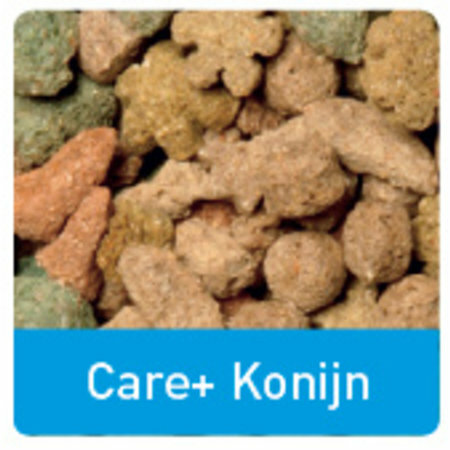 Beaphar Care + Rabbit is a food specially developed for rabbits. These special lumps have a composition that is exactly tailored to the nutritional needs of the rabbit. In addition to a large amount of fiber, the tasty chunks also contain a well-balanced ratio of the omega-3 & omega 6 fatty acids (from maize, wheat, soy and flax seed), vitamin E for the body cells, the right rough fiber content and tasty herbs. 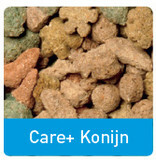 Beaphar Care + Rabbit is put together in collaboration with veterinarians and nutritionists. 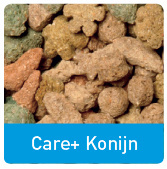 Care + is extruded, this heat treatment enables better digestion of proteins from the feed. The ingredients are tailored to the nutritional need and approach the natural diet. With Care + Rabbit you have absolutely the best for your rabbit. Care + is immediately accepted. However, it is very important to gradually switch to a new feed. In the first days, you can also mix Care + with the old food. The recommended amount of Care + per day depends on the size and weight of your rabbit: Small / Mini Pool & Dutch Dwarf ca. 60g, Dutch Dwarghangoor about 85g, Rex about 115g, French lop, Flemish Giant & Belgian Hare 170- 450g, English Giant 340-450g preferably to be divided over 2 feeds. Give clean and fresh drinking water every day and make sure that the rabbit has unlimited hay available! Mijn konijnen eten het graag. Doordat alle brokjes eigenlijk hetzelfde zijn krijg je geen selectief eetgedrag.